For whitch skin type is Micro-Dermabrasion suitable? The treatment is suitable for all skin colours and skintypes. Yes, you start with an initial course of 3 treatments witch allows the beautyspecialist to see how quickly the skin reacts to the treatment Depending on the skin type/ skin p0roblems, You will come for treatment 1 x every 1 to 2 weeks. It is recommended to perform a maintenance treatment 1x every 6 to 8 weeks. Although Micro-Dermabrasion can change the appearance of a scar, it will never be able to fully remove the scar. Depending on the depth and length of the scar (e.g. 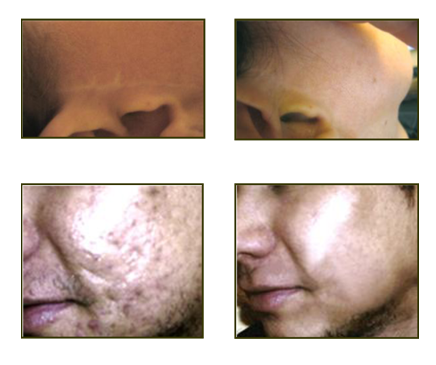 deep acne scars and/or minor superficial scars), various treatments will be necessary. Are there contra-indications for Micro-Dermabrasion? It is important that you do not expose your skin to sun or sun beds for 2 weeks prior and 2 weeks after the treatment. Treatment cannot be performed on a so-called "wet skin". For example, skin with active acne or wet eczema. A light itching feeling on the skin; The skin may become slightly discoloured (pink), though will return to normal after max. 72 hours; Immediate rejuvenation of the skin structure, improvement in skin tint and lifting of the skin. What must you definitely avoid? UV rays and heat treatments within the first 48 hours after the treatment; Swimming within the first 48 hours after the treatment; Skin care products that contain fruit acids (AHA), glycolic acids, retin-A, retinova or similar ingredients n; For at least the first 4 days after the treatment. What must I do before starting a course of treatment? You must start preparing your skin at home, two weeks prior to the treatment. This is done by using the special care package. ECURI - MICRO - DERMABRASION.